A paleontologist may be re-writing Michigan history. 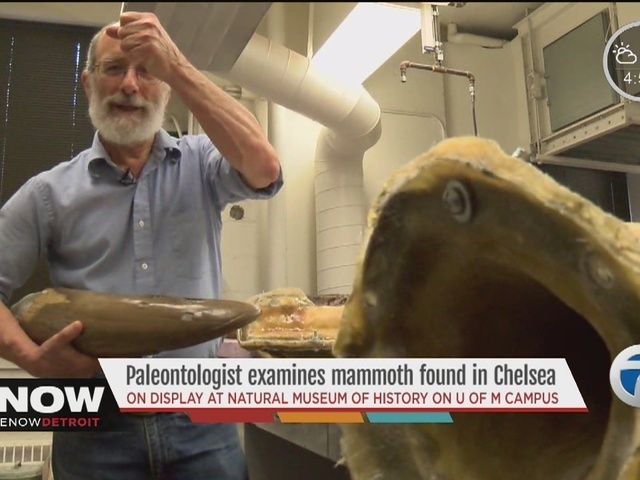 Professor Daniel Fisher recently unveiled the “Bristle Mammoth” exhibit inside the University of Michigan Museum of Natural History. Front and center in the gallery: an ice age mammoth skull that was pulled from a farmer’s field near Chelsea, Michigan on October 1, 2015. “The discovery is essentially a bit of a window to the past,” said Fisher. That’s because the remains left proof that men or women scavenged the animal after it likely died in a fight with another mammoth. While it’s no secret that mammoths were roaming the earth at the same time as humans, Fisher said this could change the timetable of when people first showed up in Michigan. The oldest documented evidence of humans in Michigan ranges from 10,000 to 13,000 years ago. While Fisher isn’t publicly sharing initial radio-carbon dating results, he admitted that if he can prove his initial findings it would change what archaeologists currently believe. While a majority of the “Bristle Mammoth,” named for the family farm where the hybrid-wooly mammoth was originally found, is on display there are pieces that have been kept inside Fisher’s lab within the museum for further study. Replicas of the tusk were cast and molded so that people who visit the museum can see the full-size of the mammoth. Visitors are able to touch some of the bones. They also get interactive opportunities to digitally explore the dig site. Recently Fisher and his students have been able to take samples of the mammoth’s 11-foot long tusk and determine what the animal’s diet was, the environment, it lived in, even how the animal was doing physically before it’s death. Mammoth tusks grow in stages. Each band tells a story. Fisher described it like a record, or an archive, that explains the history of the animal. The next step is for Fisher to return to the original excavation site to prove his initial findings. He’s already received permission to return to the site to dig up the original area where the mammoth was found to perform new research of the surrounding area. The mammoth is already on display at a temporary gallery. It’s open until January 15, 2018, when it will be moved to the Museum’s new location which will open in 2019 in the U-M Biological Science Building. The Museum and all public mammoth-related events are free. It’s open Monday through Saturday from 9 a.m. to 5 p.m. On Sunday the museum shortens it’s hours from noon to 5 p.m.